The tam juniper is one of the most commonly found junipers in Southwest landscapes because they are a low, mounding spreader whose layered branches are covered with attractive, dense, dark green foliage. 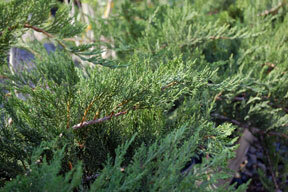 Deep-rooted and drought tolerant, they make an ideal ground cover shrub or foundation planting. They produce tiny cones and silvery blue berries in summer. Distinguishing Characteristics: Foliage is blue green when young maturing to a dark olive green.